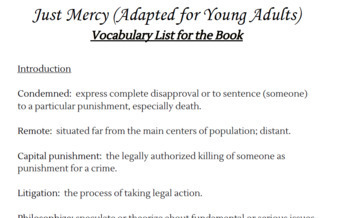 Just Mercy (Adapted for Young Adults)- VOCABULARY LIST FOR ENTIRE BOOK!!!!!!! 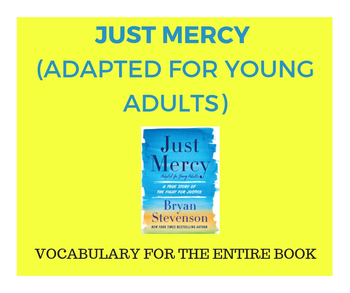 Just Mercy (Adapted for Young Adults)- A GREAT BUNDLE!!! 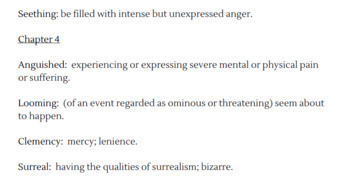 15 PAGES OF VOCABULARY FOR THE ENTIRE BOOK!!! It's in WORD so you can edit it! About 175 words, maybe a few repeats. 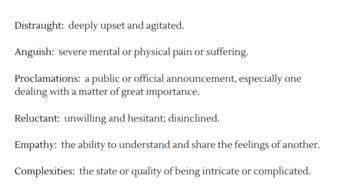 I also threw in a pdf document of the words in alphabetical order. What an amazing book to learn about justice, compassion, the law, etc. If you teach it, let me know how it goes (in the comment section). I'm curious for ideas, since this is a relatively new book. POSTERS FOR YOUR CLASS....QUOTES FROM THIS BOOK'S AUTHOR.